A tsunami advisory was in effect Thursday for Hawaii and parts of California from San Onofre State Beach to Ragged Point which is about 50 miles north of San Luis Obispo. The Pacific Tsunami Warning Center issued the advisory after a magnitude-8.3 earthquake hit off the coast of Chile. Waves in San Diego County were forecast to be from 4 to 8 inches, which was not enough to place the county under the tsunami advisory. Officials urged swimmers and surfers to keep out of the ocean, but there has been no major surge. Coast Guard Petty Officer Adrian Diaz said Southern California beaches are seeing strong currents and a surge of about a foot. Diaz added those conditions are not particularly unusual for this time of year. 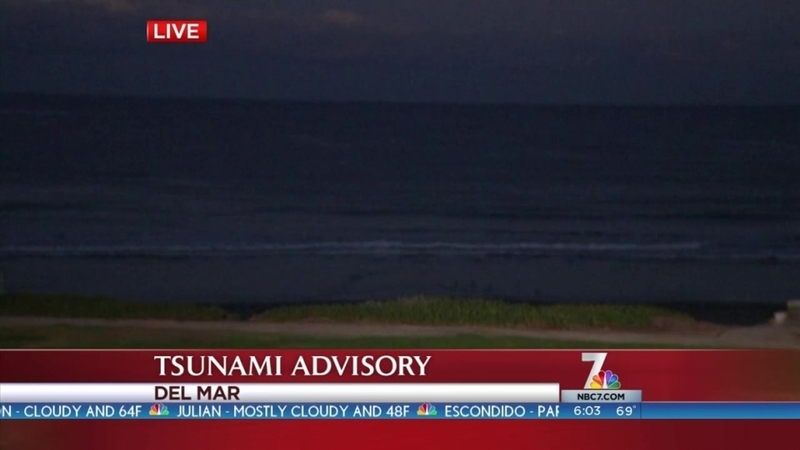 NBC 7 Meteorologist Dagmar Midcap explained that the location of San Diego's beaches - northwest to southeast and without coves - did not present many sheltered areas for the surge to get funneled into narrow areas. 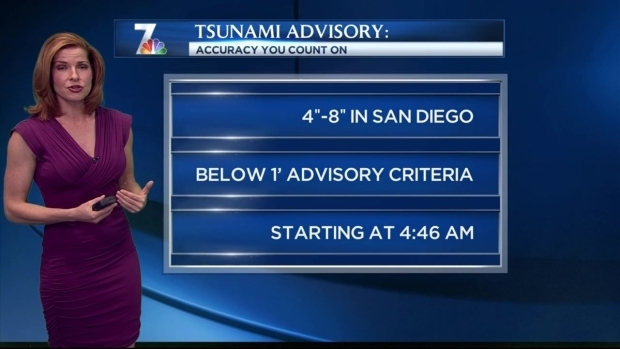 NBC 7 Meteorologist Dagmar Midcap explains why San Diego County and its beaches were not included in the advisory following Wednesday's earthquake in Chile. A tsunami advisory falls short of a tsunami warning, and waves inundating the land were not expected. There were no evacuation orders. The advisory was in effect until further notice. "The greatest threat will be the very strong underwater currents that will be hazardous to swimmers and boaters," the NOAA said in a weather statement. "The strong currents will continue for several hours after the initial wave arrival. Strong currents in harbors and bays may damage docks and other coastal structures." According to the NOAA, "tsunami advisories mean that a tsunami capable of producing strong currents or waves dangerous to persons in or very near the water is expected or is already occurring. Areas in the advisory should not expect widespread inundation. Tsunamis are a series of waves dangerous many hours after initial arrival time. The first wave may not be the largest." In Orange County, all beaches, piers and harbors were scheduled to close at 4 a.m., with the exception of Dana Point Harbor closing earlier at 2 a.m., due to strong currents. A tsunami less than a foot high was expected in Newport Beach at 4:46 a.m. The powerful temblor hit off Chile's northern coast Wednesday night, causing buildings to sway in the capital of Santiago and prompting authorities to issue a tsunami advisory for the Andean nation's coast and Hawaii. Officials reported one death in a town north of the capital and heavy waves and some flooding in a handful of coastal cities.